Let’s face it, nobody wants a chipped anything- not a chipped tooth, a chipped nail, not even a ‘chip on the shoulder’. So why put up with a chip in your windshield? You don’t have to, not when Blue-Star’s Fix your Windshield Do it Yourself Windshield Repair Kit is readily available at a store near you. The founder of Blue-Star Products Inc. has more than 25 years of experience in the windshield repair business. He is an inventor and co-holder in multiple patents in the field of windshield repairs, so needless to say, much thought went into the invention of Blue-Star Fix Your Windshield DIY Repair Kit. 1 Why Buy The Blue-Star DIY Windshield Repair Kit? Why Buy The Blue-Star DIY Windshield Repair Kit? Do you have little or no skills in windshield repair? Not to worry, this one is one of the best windshield crack and chip repair kits available today and is specially designed for the average vehicle owner with little or no prior windshield repair experience. This product effectively repairs chips to your windshield caused by damage from rocks or any other objects. It works well on any type of windshield leaving it smooth with little or no evidence of previous damage. It’s very affordable. Motor vehicle maintenance might not be the cheapest thing on your monthly budget but buying this DIY Windshield reapir Kit will not put a hole in your pocket. As a matter of fact, the kit might be cheaper than your pants and all its pockets. The kit comes with other tools needed to fix your windshield. You will get a tube of resin (the key ingredient in windshield repair), an injector through which you will apply the resin to the chip, adhesive seal, pedestal, curing film to give you a smooth finish and a detailed instruction sheet with step by step guidance. The only thing you will need to buy separately is a razor for residue removal. It’s effective. The windshield repair kit not only fix chips in your windshield, it also prevents damage from spreading so there’s no need for a complete windshield replacement. It doesn’t require too much of your time. Most of us are always on the move and are swamped with busy schedules. You may wonder if you will ever find the time to repair a windshield and complete all your daily duties. Well, this kit won’t take up too much of your time. Application takes about ten minutes and then you only need to leave it to dry. While you are waiting for it to dry, you can do your other daily tasks. It works on old chips and new ones. So whether you got a chip on your windshield two hours or two weeks ago, this Do it Yourself Repair Kit will still repair it effectively. It’s easy to use no matter what age you are. Just follow the detailed instruction sheet or watch the video on YouTube before beginning your application. The end result is amazing. After application, the chip will be barely visible if not totally invisible. No one will easily notice that your windshield was damaged. You don’t need to replace your windshield with a new one. A brand new windshield is expensive and might require you to spend money that you don’t readily have. Using this kit on your damaged windshield will save you money. You might be unsure of how much resin to apply and might end up applying too much leaving you with extra resin around the damaged area. There is an easy fix for that. The extra resin can be easily removed with window cleaner. Yes, it’s as simple as that. Just apply window cleaner to the area with the excess resin and then enjoy your shiny, smooth and well-repaired windshield. As was previously stated, buying this kit will not put a hole in your pocket. This kit will cost you only about$8-$10. What if you were to get a new windshield? That would cost about $150-$400. It’s a no-brainer. The kit is definitely more cost-effective. Even if you were to hire a professional it would still cost you more and it will rob you of the satisfaction of knowing that you fixed your windshield all by yourself. Just seeing the amazing reviews on this kit will make you want to go out and get it. 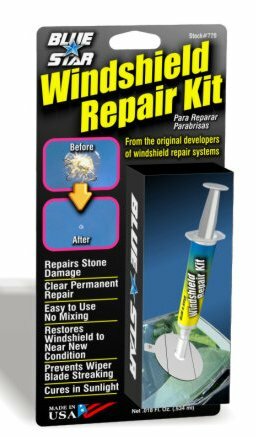 If our windshield ever gets a chip on it, the Blue-Star DIY Windshield Repair Kit will be the first choice. We love the feeling when we successfully complete a do-it-yourself task and this kit seems like it will definitely ensure my success at repairing a windshield. More than 80% of the customer reviews on Amazon rated this product between 3-5 stars. That’s definitely impressive and it shows that this kit really gets the job done. Blue-Star Fix Your Windshield Do it Yourself Windshield Repair Kit definitely has star quality. It is affordable, easy to use and the results are great. If you ever need to repair a chip on your windshield this kit should be your first and only choice.